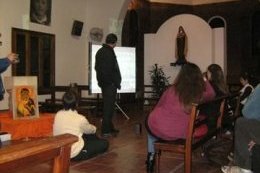 First of all I went to Córdoba, the second city of Argentina, where I was welcomed by the Salesians. Two prayers were held during my stay. The first was in the city centre, in Pius X Church, a parish for which the Salesians are responsible. The second took place in a small town an hour’s drive to the South of Córdoba, near Rio Tercero. The most surprising thing was to see the diversity of people who took part in these prayers. 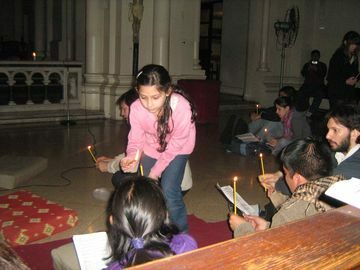 There were young adults not only from the Salesian youth ministry, but also from various youth movements and parishes. This was already a sign of the communion we want to live in the pilgrimage of trust. In the capital, there were three high points. The first was a prayer in Saint Teresa of the Infant Jesus Parish in Virreyes, one of the poorest neighbourhoods in the diocese of San Isidro. The meeting brought together young people who want to go to the meeting in Santiago, Chili. 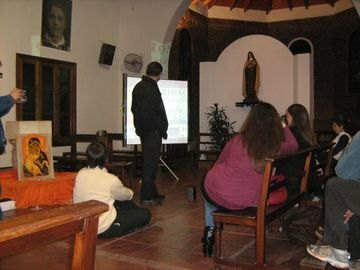 Some of the parents came too and shared their anxiety for the safety of their children who will travel to Santiago. 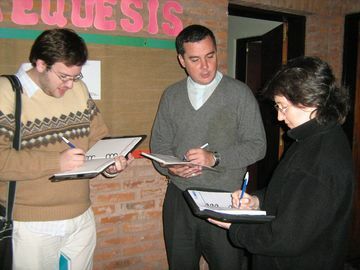 We explained how the families in Santiago were preparing to welcome the young people with great affection. And we also invited them to reflect on the significance of the word “trust”. The pilgrimage of trust invites us to go beyond ourselves and to go to meet those who are different, so as to be able to overcome the prejudices and fears that can often paralyse us: letting ourselves be welcomed by someone we do not know and thus broadening our existence. The second high point was the visit to a place “of suffering and hope”. The place in question was a shanty town called “Villa 21”. We accompanied Don Miguel Altube, a professor of physics who for years has been helping without charge to support the schooling of young people and children in the city. It was there that we discovered the Parish of Our Lady of Caacupe. The world of cities is surprising. How can neighbourhoods that are so poor, marked by drugs and violence, live side by side with places that are so rich? The contrast between the rich and the poor is shocking. It is as if the gulf between the different social groups was growing bigger every day. And yet – and this is paradoxical – at the heart of suffering there can spring up an un-hoped for joy. This joy does not come from us. It comes from God who makes himself present through people who have decided to live for others. This is the case for a group of four priests who are living in “Villa 21”. The first of them that we met, Father Charly, welcomed us and gave us a general overview of the life and the mission in this shanty town, one of the biggest in the federal capital. Straight away, we visited a place where young people attend classes in sculpture, carpentry, bakery, painting, candle making, information technology, etc. We were welcomed in the centre by Father Facundo who, as we drank mate (a typical drink in Argentina) told us the story of his vocation and his role in the pastoral activity in the shanty town. In the afternoon, we set off for the parish of the advisor for youth ministry in the Archdiocese of Buenos Aires, Father Rubén Cerassi. It was a long trip by public transport: we crossed the city from one extremity to the other. We were able to grasp just how big the city of Buenos Aires is. One third of the population of Argentina lives there. Father Rubén explained to us how, beginning a few months ago, each pastoral zone of the city offers a space for prayer with the songs of Taizé. 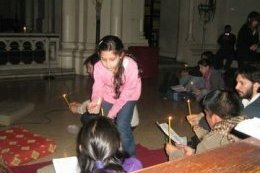 In his opinion, these spaces of prayer are very important because Argentina is going through not only an economic crisis, as was the case in 2001, but also a profound crisis of values. In Buenos Aires, the crisis can be felt in the violence the people have to face every day. Everyone we met told us that there was much insecurity and much mistrust. Prayer, going to the sources of faith, enables us to rediscover hope and the inner strength not to remain solely in the negative aspects of daily life. Prayer enables us to see reality differently. It does not signify running away or being naïf. Prayer calls us to be responsible and to stand together. The final stage of the journey was to San Miguel de Tucumán, in the North of Argentina. For some years now, young people from there have been taking part in the meetings in Taizé. The majority of them are sent by Father Dominicos who looks after the University of San Tomas, situated in the city centre, and also by the Dominican Sisters who for the last twenty years have been accompanying the young adults of the Dominican youth movement. The days in Tucumán were marked by the longstanding friendship that unites the Taizé Community and the young people there. We were warmly received by the Archbishop who gave us his blessing. The first evening, we had a meeting with seminarians from different dioceses in Argentina. 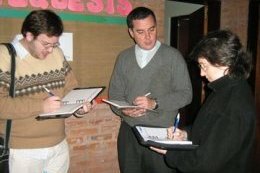 They showed much interest in the meeting in Santiago and undertook to go to the parishes of Tucumán to invite the young people to take part. The fruits of the visit have been numerous. Certain people in the parish have offered financial assistance. Some have said to me, “Please, Sandra, make sure that no young person is prevented from going to Chile because of lack of money. … Many of the young people have said that they will be going to Chile in December. Others are eager to go on mission among our brothers and sisters in the “Villa 21” shanty town. It is such a joy to try to reconcile these two worlds, and what better way to begin than praying together! It is so sad how sometimes we get lost in our prejudices. We have to continue in this way… It was like a fire, which has also lit other fires. We have many reasons to thank God. Now we have to continue working: not much more is needed for the great day in Chile! The visit was marked by simplicity, serenity and joy. We were able to communicate to others the enthusiasm for taking part in the Pilgrimage and we also received fresh impetus for the organisation. Right away, go ahead! The next prayer will be on 19 October. We thank the Community for this new experience of sharing life together; it is an experience that renews each volunteer who goes to Taizé, and all of us too as a community. May God continue to accompany us on our way! … and he is doing so already.